Ed. Note: This is the first post at a brand spankin' new unique domain name! This will allow much more opportunities for Friends of the Flange to grow. I hope to start writing travelogues of heritage railroads and other railroad-related destinations, and branch out from exclusively blogs. Unfortunately the transition erased all the previous comments and likes, so please don't be stingy about commenting here and liking the main page! 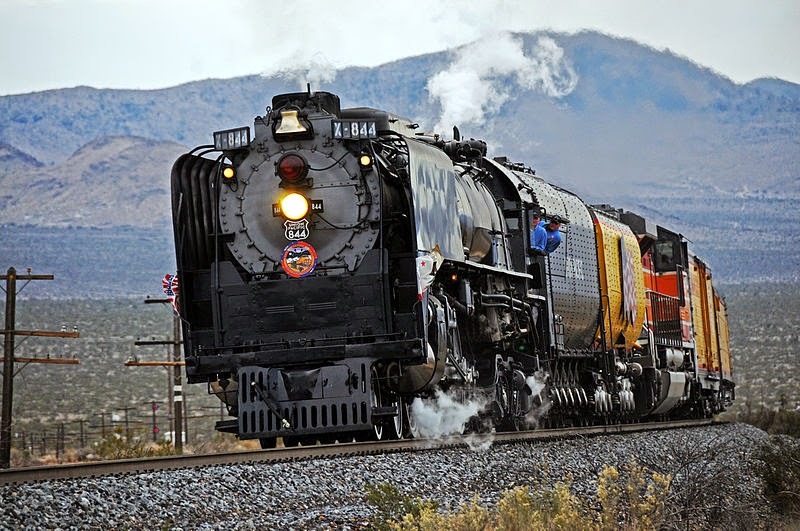 A big part of the appeal of preserving, chasing, and riding behind the steam locomotives still pulling passenger engines is getting to experience a how railroading was done in the past. Restored station houses, carefully preserved passenger cars, and staff and crew in costumes help bolster the idea that the train is suspended in time. For most riders, this is enough to fire up our imaginations and turn a simple train ride into an experience, but sometimes, concessions to the reality that it is, in hard fact, the twenty-first century must be made. The most visible deviation from history--at least, the one I’ve heard the most grumbling about--is that it’s fairly common for a diesel engine to be placed somewhere in the consist of a steam excursions, especially on those managed by Class I heritage programs. I’ve heard passengers on train runs ask “Why is that there?” with the kind of intonation in their voice that says I know you are trying to deceive me, seen the same idea articulated much more thoroughly and angrily on message boards, discussion groups. There is such a sentiment that a real steam excursion cannot in any way receive assistance from diesel engines that to some railfans, mixing the two types of motive power is a faux pas of the same explosive magnitude as adding water to acid. As much of an eyesore as this is considered to riders and photographers, there is solid logic behind attaching a diesel engine to a steam-pulled consist that have nothing to do with the diesel engine being in fact or in perception stronger than the steam engine. Most of it, in one way or another, is insurance. Running a steam program comes at an enormous cost in terms of cost, man hours, and greater than normal risk to employees and infrastructure, and introduces an element of uncertainty to every planned run. Adding a diesel helper can reduce all of these drawbacks and is, from a management standpoint, well worth the price of a bit of grumbling. Every steam engine running today has to be federally certified as in good condition before it ever sees the glint of a main line. 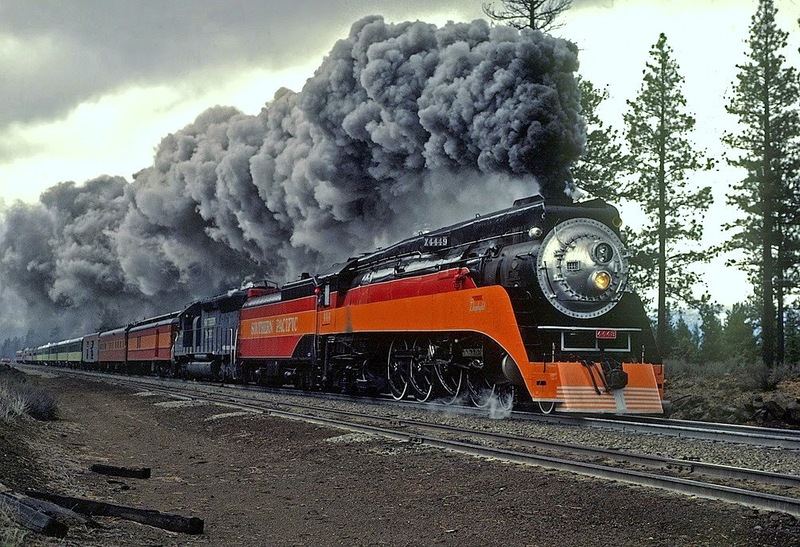 They are not especially prone to breakdown, but because of the general scarcity of surviving steam locomotives, repairs of an engine unfortunate enough to suffer a breakdown severe enough to keep it from moving would be a protracted event. Parts to mend a broken siderod, cracked wheel tire, for example, must be custom made, and their installation can not be carried out in the field. The theoretical steam engine that suffers this type of breakdown while on an excursion would, without any other type of motive power to help it along, be locked in place. It is unthinkable to allow the possibility of a main line to be blocked indefinitely, particularly if the excursion is operating on tracks otherwise reserved for freight. A delay of any kind, of course, is intolerable to the passengers who have paid to ride the train, and the last thing the train operators want is jilted riders etching their discontent on Yelp and other review web sites. Bringing a diesel engine along ensures that a train suffering mechanical difficulties will not create a bottleneck on the tracks. A tagalong diesel also provides insurance in the form of extra braking power. In a diesel engine, the air compressor is powered by electricity and operates with a steady supply of currant. 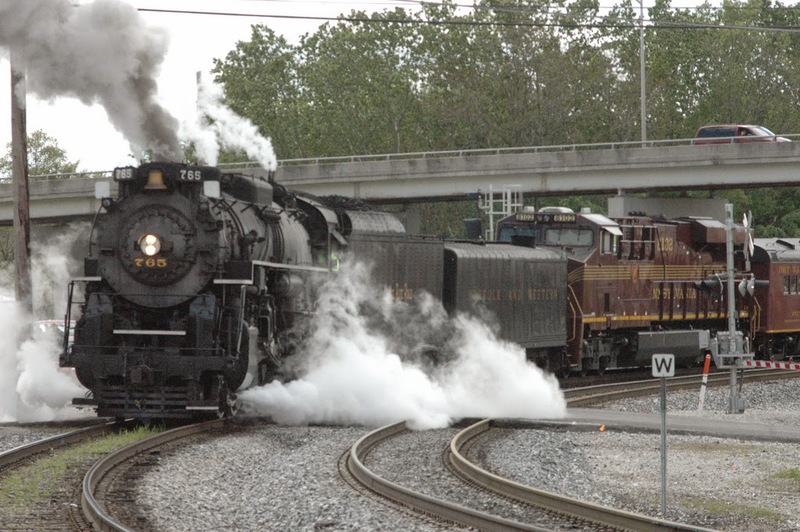 In a steam locomotive, the braking system, like every other component, will fail to work properly in the theoretical case that steam power is dramatically reduced. 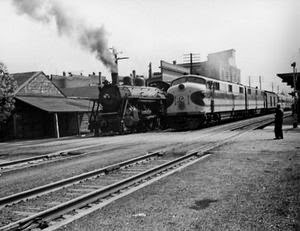 A poorly functioning compressor could fail to raise enough pressure to power off the brakes and start the train from a standstill or, of more concern, could activate the emergency brakes if the steam locomotive cannot raise enough pressure to keep the air reservoirs on the cars filled. In both cases, if there were no additional engine, the line would be blocked and the passengers would suffer an unwanted delay. The steam locomotives that run excursion services are usually fully capable of pulling the cars in the train that they are assigned. The railroad has not put a cold steam engine into neutral, and then tacked it onto the train like a piece of rolling stock and tried to pull the wool over the passengers’ eyes. The one instance when a diesel engine may typically be called to give a helpful push is when the train is first attempting to move. The pistons on a steam locomotive do not fill and deliver power at the same time, and so the locomotive must apply enough power overcome the weight of the cars and this torque before being able to move. This is inherent to the design of a steam locomotive--they can always produce more power in motion than they do at rest. The struggle to start can leave damaged spots on the track, especially if the wheels begin to slip and spin in place. Since a diesel engine applies power to the wheels on both sides of the locomotive evenly and are thus much less prone to slippage problem, the engineer may request a helpful push from behind in order to prevent damage to the tracks when starting--especially important to heritage railroads which rent their track instead of owning it outright and are at the whims of the parent company if they wish to continue operating. The last and most mundane explanation for the presence of a diesel engine is that the day’s schedule may require more than one locomotive. The heritage railroad with which I am associated takes a group of passengers to one location, then, during their hour and a half layover, takes a second group of passengers on an excursion. On steam weekends, there simply isn’t enough time to service the steam engine and give the passengers a train ride worth what they paid for. The diesel locomotive and its crew take these passengers on their run, and the steam engine can stay behind to take on water and valve oil with no conflict in scheduling. Though it may be unpleasant to have a diesel engine fouling an otherwise perfect picture of a steam excursion, and some passengers might find that it challenges their suspension of disbelief, adding a diesel engine to a steam train is a carefully calculated decision, designed to mitigate the risk of breakdown and use the tracks with as little impact as possible. Unpleasant and ironic as it is, operating steam and diesel engines together helps to ensure that heritage steam has a long and productive future. Thanks to Art Chase and David Boyer for technical insights on the braking system.